Adeline Chaplin was born 17 November 1881 at Cooks Plains, near Mt Barker, South Australia . In 1836, her father, Joseph Chaplin, from Cornwall, England arrived and settled in the Mt Barker area. On 16 March 1876 he married Honor Annie Kelly (who had arrived from Mulauch, County Clare, Ireland 23 January 1870 on the boat, The Prince of Wales). Adeline’s father was Protestant, and her mother Catholic. She was the fourth child in the family; her brothers and sisters were Anne, Ellen, John, Oliver and Archibald Tresilian. In 1886, the family moved and settled in Ozenkadnook, near Apsley in Victoria, where they established a wheat and sheep farm. In 1892 Joseph selected land near Lake Hindmarsh, on lot 21 Hindmarsh (619Ac) block 4 which is now owned by Stephen and Nikki Millar of Jeparit. Here they also grew wheat and ran sheep. The land was sandy, and because of a spring, was good for growing fruit trees, vegetables and watermelons. At this time Adeline was approximately 11 years old, and attended the Jeparit North School. Here she made a life long friendship with Lena Saphia Brookman (who became Mrs Bob Gosling). In 1918 her parents retired to Edward Street, Rainbow. Later this house was lived in by the Smalls, but is now demolished. 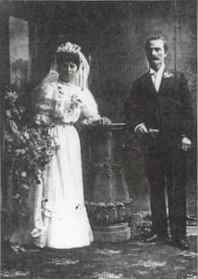 She married Joseph Mellington on 6 February 1907 at the Catholic Church, Nhill. After marriage they set up home on a block of land 2-3 miles north of Yaapeet (Joe had brothers in the same area). Their first home was average size, weatherboard, and nearer the road than the present one. The brick oven was in a separate, gable roofed building. Unfortunately the house was burnt down when Jack was a baby (he was born in 1913) and for years the family lived in the men’s hut and a tent. The family members were Joseph Francis (19/7/1908), Doreen Adeline (22/9/1911), John Sydney (17/6/1913), Reginald James (21/5/1916), Lawrence Tresilian (18/11/1920), and Valerie Anne (12/1/1925). Reg and Lawrie were born during the time the family was living in the hut. 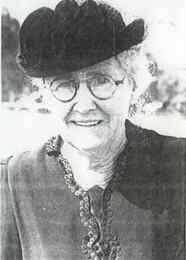 Mrs Pointon, a midwife, delivered most of Adeline’s children at her home, which is now owned by Alma Murphy. During one of the births, Adeline was infected with septicemia (blood poisoning). Prior to the use of antibiotics, this condition was very serious. In approximately 1922, a new concrete house was built by Bob Peters (Mrs Frank Brooks’ father). After the concrete foundations were down, the whole house had to be ‘boxed’ out with timber, to a width and depth of 12 inches. The boxing was then filled with hand mixed concrete and when nearly set, the ‘boards’ were removed and set up for the next level (on the exterior walls, blocks were marked in the concrete). Buckets of concrete were hauled up by rope when building the higher levels. During the building of the home, as well as looking after her sick father, Adeline was providing meals for the builders. Unfortunately water was not laid on to the house or yard so there was very little garden to protect the house from the dust. Adeline was extremely house proud and the wide verandah around the house was usually swept by her each day. After a dust storm the dust was shovelled away by the barrow load. Adeline apparently wore out more brooms than anyone else in the district. Water was carted in a 40 gallon cask (later in 44 gallon drums) filled by bucket from the dam. The buckets were usually made from 4 gallon kerosene tins. The drum was placed on a horse drawn sled which was made from a forked mallee tree. This water was used for domestic supply and for the fowls and animals. Rainwater tanks collected the water for drinking etc, but this wasn’t laid into the house either. Hot water had to be boiled in kettles in the kitchen, and in a copper for the washhouse and bathroom. There were numerous animals including dogs, riding horses, working horses, pigs and about a dozen cows. These cows also had to be milked. To economise, cocky chaff was mixed with molasses for horse feed. During the mouse plagues, when Adeline and Val went to the shed for chaff, mice would skelter everywhere. Adeline hand reared foals, poddy calves, lambs and chooks and cared for sick animals, and when needed ‘bogged’ in to help with outside farm work, stooking hay, cutting chaff, wheat cleaning, etc. When the cows were milked, the separating had to be done and some butter churned and the spare cream was put into cream cans — the original cans had narrow necks, bottle shaped, and the later ones were just cylindrical in shape. Extra cans were needed as they had to be left at the butter factory. Later these were emptied and cleaned ready to be collected the following week. At first the cans were railed from Rainbow station to Stawell and after 1920 were delivered direct to Dawson’s butter factory in Rainbow, approximately 12 miles from Yaapeet. Actually the railway line from Rainbow to Yaapeet was open in 1914, but people still liked to have a day in Rainbow to shop, meet friends and families. Adeline’s sister Anne (Mrs Dart) lived in Rainbow so I guess she visited her and her parents as well. At first they went by buggy and horse but later had a Buick car. The Buick car was purchased from WA Fischer of Nhill. Incidentally, petrol (known as benzine) was priced at 7/6 (75c) for a four gallon tin. When Joe was away camping, either droving sheep, cattle, or road contracting, Adeline and the children had full responsibility for running the farm. She also supplied ‘tucker’ for up to six of Joe’s workmen. Late Sunday, Joe took food for himself and the workers for the beginning of the week. Wednesday evening, by horse and gig, Val and her mother would deliver more food. At times Joe was contracting about 15 miles from home. Apart from all the outdoor work, Adeline was an excellent cook, and made her own bread, butter and soap. She cut up the home slaughtered meat â€“ mutton, beef, pork and bacon, etc. Spare meat was pickled or smoked in their own smoke house. She had a sewing machine and did a little sewing and patched clothes extensively. Early in her married life, she became great friends with Mrs Paul Roll (who lived across the road to the east). Later, when Lawrie started higher elementary school in Rainbow she developed a friendship with Mr & Mrs Gregson. The Gregsons offered him free board, but Lawrie’s mother, being an independent person, offered them meat, butter, etc in return. When Val married John Hofmaier, Adeline became a close friend of Mrs Hofmaier. She had been fond of horses all her life and was a great horsewoman, but had always been too busy to take part in sport. When heading for a dance, Adeline (approximately 37 years old) was thrown from her horse and was disappointed at having missed her outing. Adeline continued to ride until she reached 66 years of age. She keenly attended most types of entertainment and never let a wet night dampen her spirits. In the early days families used to congregate at the Lake for picnics which she enjoyed. Friends and relations commented how she sipped and enjoyed many cups of extremely hot tea. To keep her tea hot, the hob of the stove was a favourite resting spot for her cup. Adeline’s elder sister, Doreen, known as Dorrie, lived in Colac and was engaged to be married. Tragically, Dorrie contracted TB. It was a time of great despair and sadness. Adeline nursed her and helplessly watched as she faded away at the age of 21. Adeline was a very hard working, methodical and thrifty person. During the Depression, when many farmers couldn’t meet their commitments and went through the debt adjustment (often paying only 2/6 in the pound), the Mellingtons paid all their ‘bills’ in full. She was a very caring person. During the early war years, Reg and Val were home helping on the farm and at that time Adeline was nursing her sick brother-in-law, Tom. Occasionally, a bachelor brother-in-law, Mick, went to stay so she could ‘fatten him up’. In 1942 Reg married and the first few years he and his wife Eileen lived at the farm with Adeline and Joe. Later they bought and moved to a house in Yaapeet. Reg was gradually taking over the responsibility of the farm. Eventually, about 1949, coping with the farm became too much. Reg and Eileen moved into the farmhouse and the parents went to live in Reg’s house in town. Adeline enjoyed the luxury of a town water supply and tank water laid on in the house. At last she had the pleasure of a real garden and numerous pot plants to surround her spick and span house. After Joe died, she lived a number of years on her own, enjoying her garden, family and friends. The wet battery cabinet wireless was an interest and she loved listening to ‘The Lawsons’ and later ‘Blue Hills’ (written by Gwen Meredith). She had a satisfying life, and lived to see her children happily married and established in their own homes. She was able to enjoy the company of all her grandchildren. Late in 1959 she became frail, and for a while lived among her family but in March 1960 was admitted to the Rainbow hospital and went into a coma for about six months. She passed away on 21 September 1960. After a Roman Catholic service she was buried in the Rainbow cemetery.